Mumbai: The market benchmark BSE Sensex shed 98 points on Wednesday to close at 32,476.74 points after the Reserve Bank of India (RBI) cut repo rate by 25 bps. 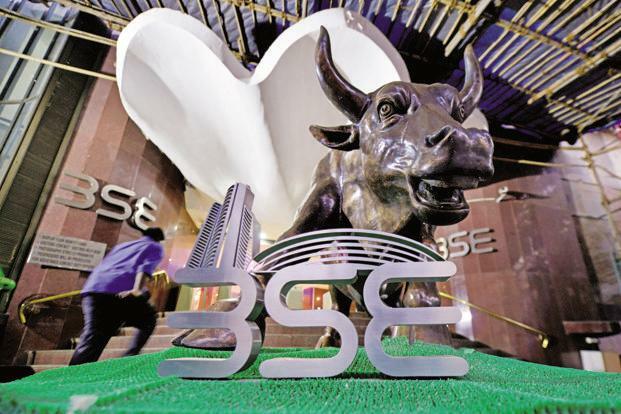 The BSE Sensex had touched an all-time high of 32,686.48 (intra-day) in the opening trade. The wider index Nifty50, too, slipped from a record high by falling 33 points to close at 10,081.50 points. The gauge had touched an all-time high of 10,137.85 at the outset on Wednesday. Traders said the RBI’s decision to lower the policy rate to 6% failed to boost sentiment. This is the first rate cut since October 2016 and the interest rate is now at a 6-year low. They added that no change in cash reserve ratio (CRR) too had a bearing. The 30-share index, which had retreated from record highs in late morning trade, was trading lower soon after the RBI announced its bi-monthly monetary review. In the wake of record low retail inflation, the monetary policy committee (MPC) headed by RBI Governor slashed policy repo rate by 25 basis points to 6% and reverse repo by a similar proportion to 5.75%. The central bank also retained the growth forecast at 7.3% for the current fiscal. The banking index, however, was marginally up by 0.14% as shares of state-run SBI rose 0.24%, Axis Bank 0.77% and ICICI Bank 0.25%. However, the BSE realty index was 0.27% down while auto shed 0.16%. Here are the latest updates and developments from the markets. ■ 3.30pm: BSE Sensex closed lower by 98 points, or 0.30%, to 32,476.74, while the Nifty 50 fell 33 points, or 0.33%, to 10,081.50. Major gainers were NTPC, Adani Ports, Hero MotoCorp and Reliance Industries (RIL) while major losers were Tata Motors, ONGC and DrReddy’s Labs on BSE. ■ 3.23pm: NTPC, Adani Ports and Hero MotoCorp are major gainers as they post gains to the tune of 4.09%, 2.58%, 2.11%, respectively. ■ 3.01pm: BSE Sensex trades lower by 109 points, or 0.34%, to 32,466 , while the Nifty 50 falls 38 points, or 0.38%, to 10,077. All sectoral indices trade in red. Nifty bank index falls by 0.37%, Nifty financial services index is lower by 0.48%, Nifty PSU bank falls by 0.31%. ■ 2.42pm: BSE Sensex trades lower by 39 points, or 0.12%, to 32,536, while the Nifty 50 falls 13 points, or 0.13%, to 10,102. ■ 2.10pm: Jai Prakash Associates Ltd shares fall 9.31%, Hindustan Copper shares fall 7.57%, Unitech stock falls 5%, and Godrej Consumer Products shares shed 3.79%. ■ 1.30pm: BSE Sensex trades lower by 35 points, or 0.11%, to 32,540, while the Nifty 50 falls 21 points, or 0.21%, to 10,094. ■ 12.41pm: Barring banking and realty stocks, all indices trade in red at NSE. The NSE Nifty realty index is higher by 0.27%, while Nifty bank index is slightly higher by a meagre 0.03%. The NSE Nifty FMCG is lower by 0.89%. ■ 12.15pm: Tata Motors, BajajAuto, Asian Paints, ONGC and DrReddy’s trade in negative with losses to the tune of 0.93%, 1%, 1.05%, 1.08%, and 1.18%, respectively. ■ 11.45am: BSE Sensex trades lower by 33 points, or 0.10%, to 32,543, while the Nifty 50 falls 17 points, or 0.17%, to 10,097. Metal and FMCG stocks fall. BSE metal index declines by 0.88%, and BSE FMCG index falls by 0.56%. ■ 11.00am: BSE Sensex trades lower by 29 points, or 0.09%, to 32,546, while the Nifty 50 falls 17 points, or 0.16%, to 10,098. Bajaj Auto and Asian Paints fall by 1.10% and 0.84%, respectively. ■ 9.30am: Reliance Defence and Engineering Ltd fell 2.7% to Rs60.30 after the company reported a loss of Rs230.42 crore in June quarter against Rs134.50 crore a year ago. ■ 9.25am: Hindustan Copper Ltd fell 7% to Rs65.70 . The government will sell 3.70 crore equity shares in Hindustan Copper Ltd (HCL) at a floor price of Rs64.75 apiece through a two-day offer-for-sale (OFS) beginning Wednesday, with an option to issue a similar number of shares in case of over subscription. ■ 9.20am: Gujarat State Fertilizers & Chemicals Ltd rose 3.4% to Rs139.90 after the company said it has re-started its Ammonia-IV plant. Bajaj Auto Ltd fell 0.6% to Rs2,807.45 after the company reported 6.7% decline in its July month sales to 3.07 lakh units. ■ 9.18am: Marico Ltd fell 1.7% to Rs320.70 after the company reported an 11.9% decline year-on-year in net profit for the first quarter as wholesale, rural, and Canteen Stores Department (CSD) channels de-stocked in the weeks before implementation of the goods and services tax (GST) on 1 July, affecting sales volumes. ■ 9.15am: The rupee opened at 64.12 a dollar. At 9.15am, the rupee was trading at 64.13 a dollar, down 0.06% from its Tuesday’s close of 64.19. ■ 9.10am: Lupin Ltd rose 1.4% to Rs1,032 after US drug regulator approved generic lidex ointment. Hero MotoCorp Ltd rose 1.4% to Rs3,772 after the company reported 17% increase in its July sales to 6.23 lakhs units. ■ 9.05am: The 10-year bond yield was at 6.445%, compared to its previous close of 6.442%. Bond yields and prices move in opposite directions. ■ 9.00am: Asian currencies were trading lower. South Korean won was down 0.31%, Taiwan dollar 0.23%, Singapore dollar 0.18%, Japanese yen 0.17%, Thai Baht 0.13%, China renminbi 0.12%, Philippines peso 0.1%, Indonesian rupiah 0.04%. Be the first to comment on "BSE Sensex:Nifty, Sensex post losses as RBI falls short of 50 bps rate cut hopes"